The Sheffield and South Yorkshire Navigation runs for 40 miles between Sheffield, South Yorkshire, and the River Trent, UK. It is made up of the Sheffield and Tinsley Canal, Don Navigation and Stainforth and Keadby Canal, along with the New Junction Canal. 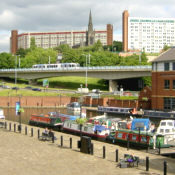 Locks between Rotherham and the New Junction were enlarged in the 1980s to enable larger craft to use them. A small amount of commercial traffic still uses this part of the waterway. The other parts of the waterway are now used purely for leisure.